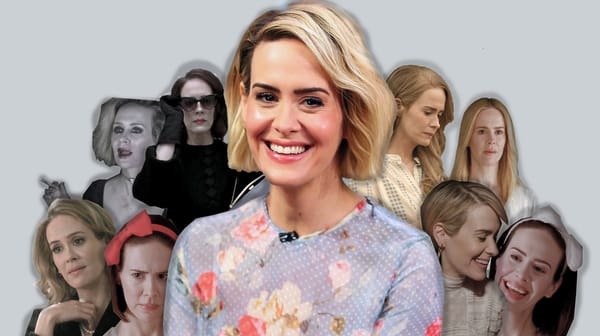 Sarah Paulson was born today December 17, in 1974. She is an Emmy award-winning actress. In 2017, she was named one of Time magazine's 100 most influential people of the year. Paulson was born in Tampa, Florida. She began working as an actress right out of high school. She appeared in the Horton Foote play Talking Pictures at the Signature Theatre, and in an episode of Law & Order in 1994. The next year Paulson appeared in the Hallmark film Friends at Last (1995) opposite Kathleen Turner. In the 2006–07 television season, Paulson co-starred in NBC's Studio 60 on the Sunset Strip, playing Harriet Hayes, one of the stars of the show-within-a-show. This role earned her a Golden Globe award nomination. Paulson's film credits include Down with Love, What Women Want, The Other Sister, Levitation, and Serenity. Paulson received Emmy and Golden Globe award nominations for her performance as Nicolle Wallace in the HBO film Game Change (2012). She starred as Mary Epps in the 2013 historical drama film 12 Years a Slave and as Abby Gerhard in the 2015 drama film Carol. Both films received widespread critical acclaim and were nominated for multiple Academy Awards. In 2016, Paulson portrayed real life prosecutor Marcia Clark in the first season of the anthology series American Crime Story, subtitled The People v. O. J. Simpson. For her work in the series, she won the Emmy Award, Critics' Choice Television Award, TCA Award, Screen Actors Guild Award and Golden Globe Award for Outstanding Lead Actress. Paulson has been in all seven seasons of the anthology series American Horror Story. In 2011, she guest starred in three episodes of American Horror Story, playing medium Billie Dean Howard. Paulson returned for season two, AHS: Asylum, in which she played a new character, Lana Winters, a gay writer who goes undercover in an asylum. She appeared in the third season of the series, titled AHS: Coven as Cordelia Foxx, a witch who runs an academy for other young witches. She appeared in the fourth season of the show, titled AHS: Freak Show, portraying conjoined twin sisters Bette and Dot Tattler. She returned for the fifth season, subtitled AHS: Hotel, portraying the role of Hypodermic Sally. She also portrayed Billie Dean Howard again for the last episode of the season. Paulson went on to star in the sixth iteration of the series, subtitled AHS: Roanoke. She portrayed British actress Audrey Tindall, who appeared in the My Roanoke Nightmare documentary as tortured wife and yoga instructor Shelby Miller. In AHS: Cult, Paulson plays Ally Mayfair-Richards, a lesbian restaurant owner whose is afraid of clowns and many other things. She received four Emmy nominations for acting in AHS so far. Paulson has also had a successful theatre career. In 2005, she starred as Laura Wingfield in a revival of Tennessee Williams' play The Glass Menagerie. In 2010, Paulson starred in Donald Margulies's Collected Stories alongside Linda Lavin. Paulson starred in a revival of Lanford Wilson's Talley's Folly alongside Danny Burstein in 2013. Paulson dated actress Cherry Jones from 2004 to 2009. In an interview with Broadway.com in 2013, referring to her sexuality, she said "the situation is fluid for me." Before her relationship with Jones, she had only dated men, including playwright Tracy Letts, to whom she was engaged. Since early 2015, Paulson has been in a relationship with actress Holland Taylor.